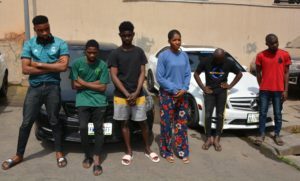 They were arrested at Karu and Mpape settlements of Abuja, on February 7, 2019. Items recovered from them include three Mercedes Benz cars, five laptop computers, 10 handsets, ATM cards and other incriminating documents. A statement by EFCC acting spokesman, Tony Orilade, said that they would soon be charged to court.